We have a wonderful group of speakers and guests sharing with us this year at TypeParis. We wanted to find out a little more about each of them, so came up with a series of questions which they have generously taken the time to answer. 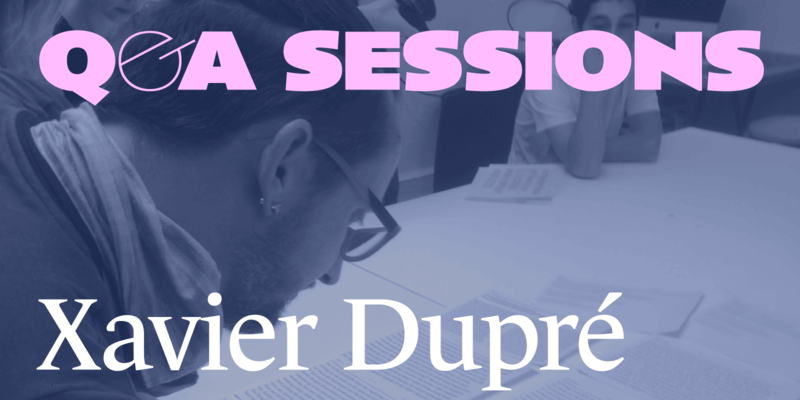 We have the great privilege this week of hearing from Xavier Dupré, an award-winning type designer and one of the core instructors from last year’s programme, who is once again joining the team for TypeParis17. Xavier lives what I consider to be a very interesting life; he currently resides in Cambodia, has studied graphic design, calligraphy and typography, and, amongst many other things, designs Latin and Khmer typefaces for NGOs. Read more about him on the TypeParis People page. What is it you like about typography? Xavier Dupré: I like the infinity of shapes, there is always something to do even though most people don’t see the difference. I’m a collector and I like to collect letters and fonts. At what point in history would you choose to live? If I consider only type design, the 21st century is certainly the best. But I especially like the first half of the 20th century. Exciting period for creation, and the last great period for exploration trips too. The artistic life in Paris was really gorgeous, everything was possible. I like also the art of living during the Antiquity, in Athens or Rome. Let’s invent the time machine! Has your creative process changed over the years? Not so much actually. I don’t like to learn new softwares, I’ve worked in FontLab for more than 10 years. The good quality of screens means I no longer need to print test proofs. The thing I’m interested in is calligraphy, and drawing on an iPad pro. Should buy one. What is your favourite magazine/movie/T.V. series? I never read magazines (which are just advertising) and I don’t watch TV, so, it’s quite rare I watch series (even if I can get them online). I prefer to watch old movies or recent French movies. One among the recent ones is Island of Lost Souls, the original version from 1932 with Charles Laughton, a charming horror movie. What sparked your interest in type design? By destroying existing typefaces. That was my first experience in type design, then I thought it was more interesting to develop real creations and I discovered the world of types. My last work is always the one I’m most proud of. I have some favourite designs but I don’t think I’m completely satisfied with any of them. I still try to improve my shapes year after year and propose good work, so the best should be the next one. Name something that inspires you. Old movie posters or old illustrated books are my passions, but this is directly linked to graphic design and typography. I used to draw or photograph plants or insects before, I don’t do it anymore but still consider that observing nature is probably the best way to see perfect curves and a variety of shapes.